The chansons de geste, Old French for "songs of heroic deeds", are the epic poetry that appears at the dawn of French literature. 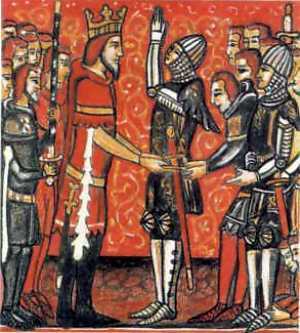 Roland pledges his fealty to Charlemagne; from a manuscript of a chanson de geste. Written in Old French by the earliest poets, the trouv�res, they typically deal with the martial valour of paladins, heroes from the age of Charles Martel and Charlemagne, and their combats against the Moors and Saracens. To these historical legends, a stiff dose of fantasy is added; giants, magic, and monsters appear among the foes along with Muslims. As the genre aged, the historical and military aspects waned, and the fantastic aspects came to dominate. The subject matter of the chansons de geste became known as the Matter of France. This contrasted them with the Matter of Britain, dealing with King Arthur and his knights; and the Matter of Rome, which mixed Greek mythology with the tales of Alexander the Great, Julius C�sar, and other figures from classical antiquity who were given medi�val makeovers as exemplars of chivalry. The origin of the chanson de geste as a form is much debated. The nineteenth century medi�valist Gaston Paris believed that they originated in oral epics called cantil�nes, which were more or less contemporary with the military events described; and that they were originally composed by bards who followed the courts of kings and military leaders after the custom of Scandinavia and the Celtic world. Another school of thought, championed by Joseph B�dier, holds that the poems were the invention of the trouv�res themselves, discounting the possibility of Germanic influence in their invention. B�dier also suggests that some of the stories were first invented by monks, who used them to advertise pilgrimage sites by connecting them not only with saints but also by legendary heroes of folklore. Magical relics frequently appear in the tales. Gent ad le cors et le cuntenant fier. S'est kil demandet, ne l'estoet enseigner. there is a throne made entirely of gold. his beard is white, with a full head of hair. He is noble in carriage, and proud of bearing. The songs were designed to be recited to music by the trouv�res, who typically accompanied themselves on the vielle, a medi�val fiddle played with a bow. Since paper was prohibitively expensive and many poets were unable to read, trouveres would sing the song by heart. Because memorization played a great role in the distribution of the chanson de geste, many stanzas are very formulaic in nature to insure that a poet could improvise part of the story on the spot if need be. Approximately one hundred of the poems themselves survive, in manuscripts that date from the twelfth to the fifteenth century. The Geste du roi, whose chief character was Charlemagne himself, and whose theme was his role as the divine champion of Christianity. This cycle contains the best known of the chansons, the Chanson de Roland. The Geste de Garin de Monglane, whose central character was Garin de Monglane. These dealt with knights who were typically younger sons, not heirs, who seek land and glory through combat with the "paynim foes." The Geste de Doon de Mayence; this cycle concerned traitors and rebels against royal authority, and in each case the revolt ends with the defeat of the rebels and their eventual repentance. The poems contained a very small and unvaried assortment of characters; the repertoire of valiant hero, the brave traitor, the shifty or cowardly traitor, the Saracen giant, and so forth is one that is easily exhausted. As the genre matured, fantasy elements were introduced. Some of the characters that were devised by the trouv�res in this manner include the fairy Oberon, who made his literary debut in the Chanson de Huon de Bordeaux; and the magic horse Bayard, who first appears in the Chanson de Renaud de Montauban. Eventually, in the last chansons de geste, the element of self-parody appears; even the august Charlemagne was not above ridicule. The chansons de geste created a body of mythology that lived on well after the creative force of the genre itself was spent. The Italian epics of Torquato Tasso and Ludovico Ariosto are all founded on the legends of the paladins of Charlemagne that first appeared in the chansons de geste. As such, their incidents and plot devices later became central to works of English literature such as Edmund Spenser's The Faerie Queene; Spenser attempted to adapt the form devised to tell the tale of the triumph of Christianity over Islam to tell instead of the triumph of Protestantism over Roman Catholicism. Indeed, until the 19th century, the tales of Roland and Charlemagne were as important as the tales of King Arthur and the Holy Grail, and the Italian epics on these themes were still accounted major works of literature. It is only in the later nineteenth and twentieth century that the Matter of France was finally eclipsed by the Matter of Britain.